Miana is a utility for setting the creation and/or modification date and/or time of a folder and all of its contents to a specified date and time. • Specify which date to set: modification date, creation date, both dates or the EXIF date for image files. Auxiliary functions in the File menu compute the days elapsed since a files modification and creation date, and for displaying an image file's EXIF date. After Miana is launched it displays a status window. Click its button and use the Preferences window to specify the desired date and time, and other options. 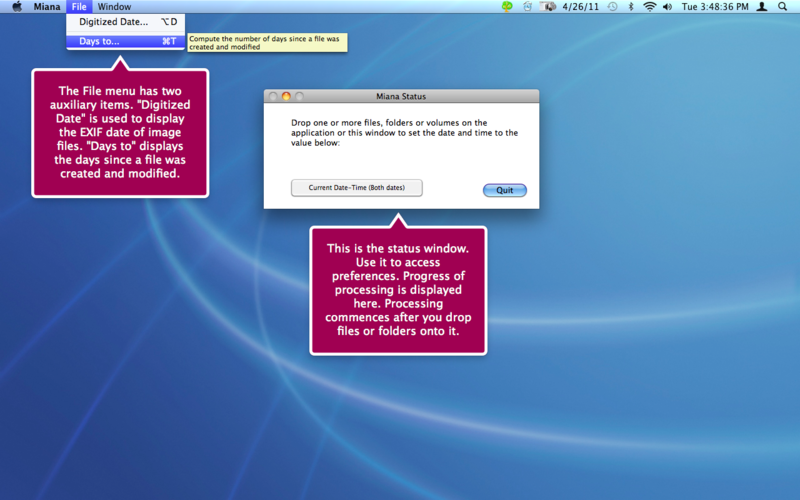 Then drag one or more files or folders on top of the Miana application icon in the Finder or the status window. Miana immediately begins to traverse the folders and, optionally, all the subfolders, changing the creation and/or modification date and time of everything it finds to the specified date and time.